A shipping channel was dug in the 19th century by the US Army Corps of Engineers in the Harlem River and crossed by a succession of fixed and movable bridges. Today, the Harlem River is eight miles long (between the East and Hudson Rivers), it's about 18 ft deep at low tide, and it's about 350 ft wide. Most of the movable bridges cross at a skew, making the main span even longer, and so the piers were built in the river. 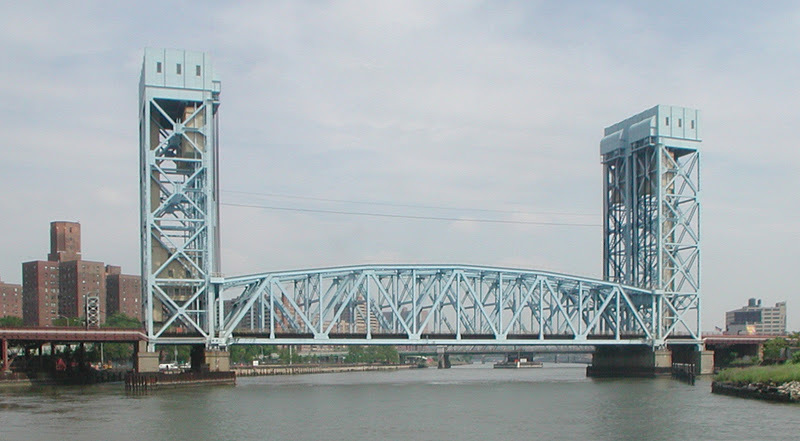 The current Park Avenue Bridge is the fourth movable bridge at this site and the first lift bridge. It was built between 1954 and 1956 alongside the older bridge. It carries four railroad tracks and has 25 ft of vertical clearance closed and 135 ft when it's open. The main span is 340 ft long. It was originally owned by the New York, New Haven, and Hartford Railroad and it's currently owned by Metro North. New York City's Bridges: Park Avenue (Metro-North) Railroad Bridge by Mark Yashinsky is licensed under a Creative Commons Attribution-NonCommercial-ShareAlike 3.0 United States License.